This is off-topic, but the earthquake which hit Northern California early this morning has a pretty interesting chart. The time is approximate, within 10 minutes. Note first that Uranus (disruption, surprises) is at the top of the chart conjunct the South Node (loss, dissolution). This conjunction is at the center of a yod between Mercury (the bringer of information) and a Saturn-Mars conjunction (action and violence with/against structure). Uranus also aspects nearly everything else on the chart. In this configuration the "message" Mercury brings may be one of destruction (Pluto, trine Mercury) and disruption (Uranus, quincunx Mercury). Note that we are just past a "New Moon" with the Sun and Moon very tightly parallel. Astrology aside, this could well have real and measurable gravitational impact. Ceres in the Fourth House is interesting though inconclusive. Ceres-Moon contacts seem to bear some correlation to kidnappings, but in the case of Napa we're looking at homes (buildings) being taken away rather than children. Ceres was in Cancer in the Fourth House during the big 1989 quake. 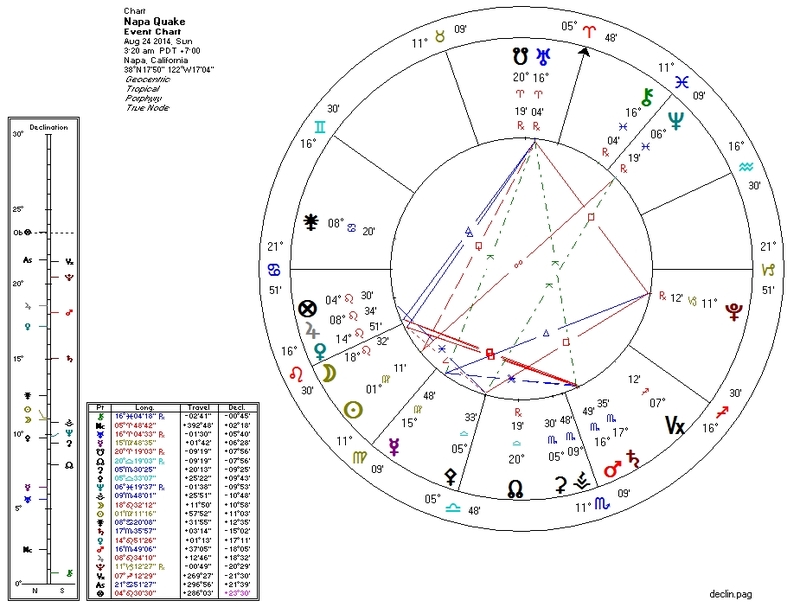 Saturn (structure/authority) on the chart for the State of California is at 19Aries49. That's where Uranus and the South Node are for the earthquake chart. I don't think Pallas on the IC is relevant, but I'll be keeping my eye out for it in the future. I am (probably) the world's foremost expert on the practical astrology of Pallas. Claimed expertise comes from hundreds of trial-and-error case studies, most of which I have posted online for free perusal by the public. I haven't studied the astrology of earthquakes, so this post is mostly for "fun" and won't be the most authoritative astrological word on the topic.